Kate, Duchess of Cambridge, visits Great Tower Scout Camp on March 22, 2013, in Windermere, Cumbria, United Kingdom. THE Duchess of Cambridge got stuck in as she helped Cub Scouts bake bread, climb and learn camping survival skills as snow fell in the Lake District. DESPITE marrying into the Royal Family, the Duchess of Cambridge still likes getting her hands dirty. 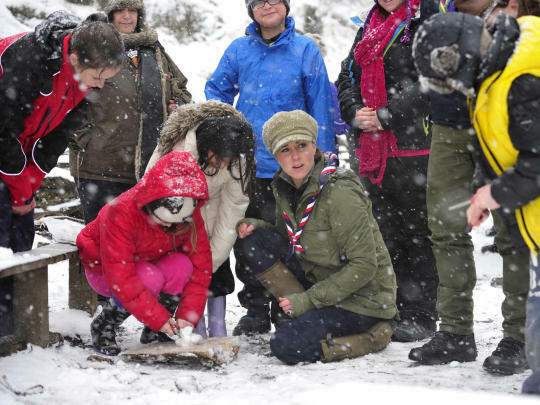 Pregnant Kate spent yesterday in the snowy Lake District helping Cub Scouts cook, climb and learn camping survival skills. Ignoring concerns about getting her priceless engagement ring, which once belonged to Princess Diana, messy, she got stuck in by kneading sticky ­unleavened bread with fellow adult volunteers. Kate laughed as she rolled the dough of flour, water, sugar and oil before twisting it round a stick. As they toasted their twists, she was in hysterics at the state of some of her fellow volunteers’ bread. 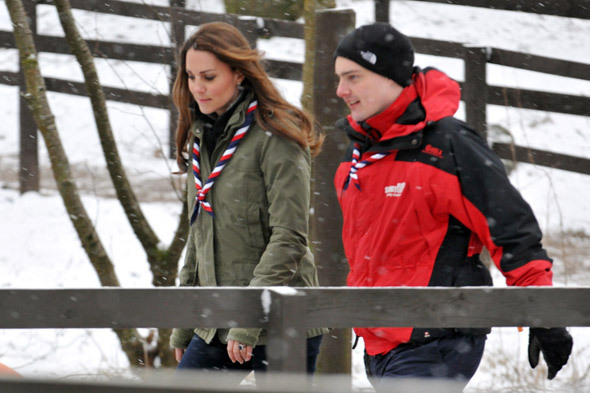 The 31-year-old duchess has been ­volunteering privately with the Scouts near the home she shares with Prince William in Anglesey since last January. 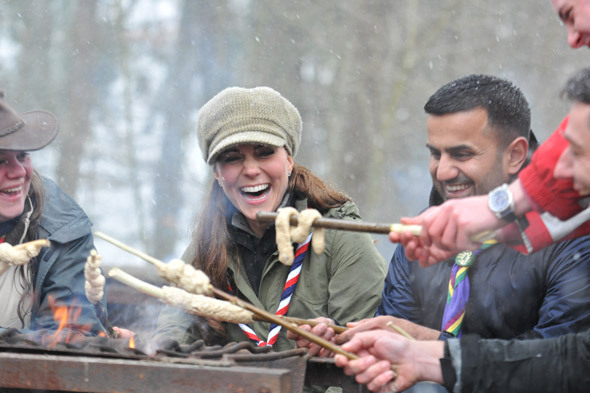 Yesterday, she publicly lent her support to the adventuring organisation with a visit to Great Tower Scout Camp in Newby Bridge. She was later joined by about 30 Cub Scouts aged eight to 10, who she helped light fires and climb up trees using a safety wire. Assistant director of the Scouts, Simon Carter, said: “We have 35,000 young people across the UK who can’t join up because we don’t have enough adult volunteer leaders.